PLEASE NOTE - THE CASE HAS BEEN CHANGED TO A BLACK PLASTIC AMMO BOX STYLE CASE. THERE ARE NO LONGER HOLDING SPOTS FOR THE ACCESSORIES. Over 25 YEARS of satisfied customers! We are the longest running authorized distributor in the U. Distributor on the market today! Your satisfaction is our goal. Now we are offering a. With all new Torch Kit Orders. (2) Stainless Steel Weld Rods. (3) Mild Steel Weld Rods. (1) Aluminum Blue Shade Lens. (1) 2oz jar of Aluminum Welding Flux. (1) 2oz jar of Cast Iron Welding Flux. (4) Mild Steel sample plates. 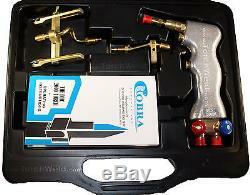 COBRA DHC 2000 WELDING AND CUTTING TORCH SYSTEM. (Formerly Dillon Mk IV Henrob 2000). With This Torch, You can weld pretty much everything except Titanium. ALUMINIUM, MILD STEEL, STAINLESS, COPPER, BRASS, CAST IRON, etc. You will be amazed at the cutting abilities that this torch allows. You will have the ability to make cuts that you can only get with a Plasma Cutter. Uses Standard Oxygen and Acetylene setup for most all your welding and cutting needs. 50 to 70% gas savings. 100% made in USA since 1982. Welds like a Tig or MiG Welder. No distortion on body panel. One gas welding system that does it all. Great for novices and/or experienced welders. High combustion efficiency leaves virtually no unburnt oxygen in secondary flame surrounding. Shielding the area from contamination and eliminating the need for flux in most metals. With its specially designed tips and universal flame setting (just off feather) you can now weld from your finest. Jewelry and all types of metals up 1/2 inch thick without ever having to change pressures. Uses standard regulator and hose fittings. Users can benefit by purchasing our lower pressure regulators to better adjust pressure. Uses only 4 PSI of oxygen and acetylene gas. Unique mixing chamber reduces flame velocity up to 80% compared with a conventional torch. Less distortion than with MIG welds. Softer welds that will easily grind, hammer and dolly. With the COBRA 2000 TORCH you will use less body filler. Every kit comes complete with user friendly instructions and an array of quality tips for all types of welding and cutting. The ergonomically designed pistol grip body, its patented mixing chamber, its and low velocity system and tips, delivers with almost laser like quality a very intense concentrate narrow soft flame the burns 900 degrees hotter than a conventional torch, using only 4 PSI equal pressure on oxygen and acetylene. This torch is compatible with your existing regulators and hose but our complete line of optimal pro-pack accessories and additional tips, a curve and straight extension for nozzle for soldering make the DHC 2000 the ultimate tool in any shop! THE DHC 2000 IS PORTABLE AND USES ONLY 4 LBS PRESSURE WHICH CAN RESULT IN SAVING UP TO 70% ON FUEL COST. Anyone with a minimal amount of skills and/or little practice can weld any ferrous and non ferrous metal and cut a pencil thin line through sheet metal and steel up to 1 inch thick... Included in the Torch kit. Case that supports all included and optional accessories. Welding Tips (0, 0.5, 1, 2, 3). Sheet metal and plate cutting attachments. A comprehensive and instructive manual. WHO AND WHAT IS IT FOR? We do not make International sales to. Australia, UK, Africa, Asia, Europe, Middle East, Oceania, Southeast Asia. Failure to do so could result in injury. 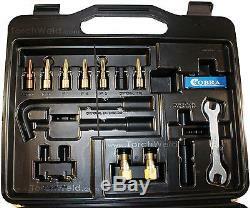 The Cobra DHC 2000 welding cutting hand piece has a. The product will not be liable for any incidental, indirect, consequential, or damages of any nature arising from the sale of the product. We make descriptions as detailed as possible. We will make every attempt to assist you. We will be updating our store regularly with new items. 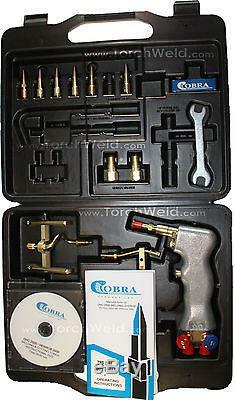 The item "DETROIT\COBRA DHC 2000 WELDING AND CUTTING TORCH SYSTEM STANDARD KIT" is in sale since Wednesday, March 28, 2018. This item is in the category "Business & Industrial\CNC, Metalworking & Manufacturing\Welding & Soldering Equipment\Welding\Welders, Cutters & Torches\Gas Welding Torches". The seller is "torchweld" and is located in Woodruff, South Carolina. This item can be shipped to United States.